Hey guys, you may all have heard about different ways to download torrent files. And some of you may also have downloaded them using uTorrent, BitTorrent etc. That is a traditional method which is frequently used by most of the people to download torrents. Probably in most cases, the headache will be the low download speed. This can be resolved if you can download torrent files with IDM. So in this article, we will share some methods by which the problem of slow speed will be solved forever, and you will experience far better and smoother downloading experience. You have to use IDM, yes you read it right we have to use IDM to download large torrent files. The whole method is very simple you have just to use Torrent to IDM converter. This is very smooth and will work like a wonder. Torrents are very special in itself. There are a number of things can be easily downloaded from torrent like games, videos, apps, movies etc. Sometimes you can face problems related to speed as we mentioned before. This usually happens when you try to download a torrent which was uploaded a long time ago. And in most cases, it means less number of seeders available. PS: Downloading Torrent files? Kickasstorrent is down? You can check 5 Kickasstorrent alternatives from Earnspree. Torrent files are the file with the extension of .torrent which are hardly less than an MB. But it contains a list of many folder and files. It also has the list of network trackers and other details. These can be downloaded by using the torrent clients like BitTorrent, uTorrent or any other best torrent client. Once you load the torrent file on your Client, it will contact all the trackers to provide a list of peers and seeds, so that you can start downloading. If you are looking to download anime via torrent, then you can directly visit anime streaming sites. In this method, we are going to use a website called ByteBx. Here, you can upload your torrent file and that will be downloaded to their servers which will have insanely high speed. And then once the download completes on their server you can easily download them using your download manager, in this case, IDM. By default it provides you the free account which has the limit of 2.5 GB storage, that means you can download any torrent file by the maximum size of 2.5 GB. You can always upgrade to a premium account if you want to download larger files. First of all, go to ByteBx and create a new account. 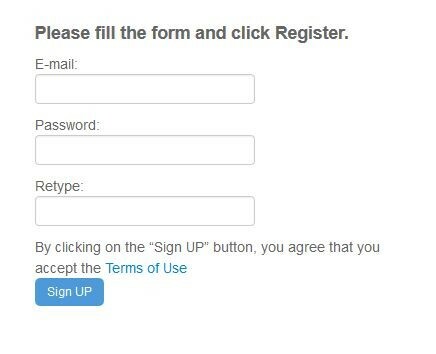 Click on “Sign Up” and enter your credentials like your Name, Email Id, Password, etc. Confirm your Email account and log in to ByteBx with same details which you filled earlier. You will be redirected to its home where you will get three options, Upload File, Upload URL and Upload Torrent. Click on the third option “Upload Torrent” then click on “Choose File”. Browse and select the .torrent file which you want to download. Now within few seconds, you will see a blue colored “download” button. Click it to start your download. Great! You have successfully downloaded the torrent file with IDM. You can also use your browser or any other download manager. In this approach, we going to use a site called ZbigZ. This is the best alternative you can find to Bytebx. Just like other websites, there are two types of accounts available. One is free and the other is premium and with cloud storage, isn’t that great! Its premium package is starting from 142 INR [2.09$] which is too low compared to other torrent caching sites. This website is also mobile responsive, so you can also open this site on your smartphone. Firstly, copy the torrent file link you want to download. Now, open ZbigZ on your smartphone or PC/Laptop. Create a free account by clicking on “Sign Up” button and by adding your relevant information. Now paste the torrent file link you copied in step 1 in the white box and hit on “GO”. Wait for some time till it’s complete its process. After the completion of the procedure, click on blue colored “Download” button to begin the download. It’s Done! You have successfully downloaded the torrent file using ZbigZ with IDM. Also, you can even download the files in your preferred browser. The process of downloading torrent with IDM is quite similar to the ones that we discussed earlier. i.e Sign Up, Paste the magnet link or upload the torrent file and then download the file using IDM. Hope you’d like it. Both the methods are very easy to apply and completely working. So you won’t face any problem while using both the methods. Torrent to IDM can be a great switch for you. You will notice a big change in speed and overall download time. As far I’m concerned both the methods at least deserve one try. Enjoy unlimited torrent downloading with IDM and with maximum speed by using the above-mentioned methods. If you face any problem with whatever step, then let us know in the comment section below. Thank you so much! Keep visiting our site for more tricks and hacks. How to Recover Photos from Corrupted SD card? Thanks for the methods, working but takes a loooong time to load and seed. As most torrents have 0 or 1 seeds. If you’re looking for a tool to download torrent files, then there seems to be nothing better than IDM. You can easily download torrent files with IDM help.